Katie Fisher is a mom of four and wife to her high school sweetheart, Samuel. After a brief stint as an office assistant in her younger years, she now pours her heart and soul into her stories (and her family, of course). She loves to write romance, sometimes with a dash of suspense, but always sweet. Having grown up close to an Amish community in Pennsylvania, she fell in love with the simple and fulfilling Amish lifestyle. 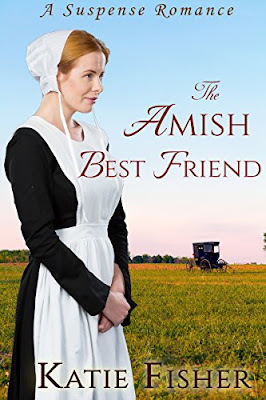 She expresses this love in her stories, which take place in Amish communities and are always full of inspiration and hope. Favorite things include happily-ever-afters, gingerbread cookies and long evenings on the porch. An Amish girl prays for answers. Will she find them? Life in the small Amish community of Orthause, Pennsylvania is predictable to Hannah Zook. As the teacher of the one-classroom school, Hannah is happy with her life and relationship with God. The only question she has concerns Eli Reimer, the Mennonite man who wishes to marry her. Eli is the sort of man Hannah has always dreamed of marrying. But in order to marry him, she must give up her faith and join his. But when a man is found murdered, Hannah ends up with much more than romance on her mind. The victim’s wife Martha recently left him, and everybody knows why. Now she’s the number one suspect. Hannah knows her friend is innocent and will do everything to prove it. She is joined in her quest by her childhood friend, Abram, who quietly supports her even when others tell her to mind her own business. And as she works to solve the murder, Hannah might just find the answers to her prayers about her future–and he might have been under her nose the whole time.